Are you still saying, “I don’t know what I want to be when I grow up” and you’re already grown up? Are you in a job that you don’t like, but feel stuck in because you really don’t know what you’d rather do? Do you know what you’d rather do but it’s financially unfeasible? Are you in a life transition? Are you going from high school to college, college to a job, career to retirement and don’t know what to do? If this is you, I know you, because I’ve been through all these scenarios. I’ve spent half my life trying to figure out the color of my parachute. I read a million books, took countless quizzes in magazines, talked to guidance and career counselors, took interest inventories, even prayed to god to send me a sign telling me why I was put on this earth. It was kind of interesting, but none of it worked. What did work was when I started paying attention to my one wild and precious life, and not how I could fit this wild life into the existing world of work, and careers, and jobs. My version of “paying attention” involved making lists. Lists of all the things I liked and all the things I hated. 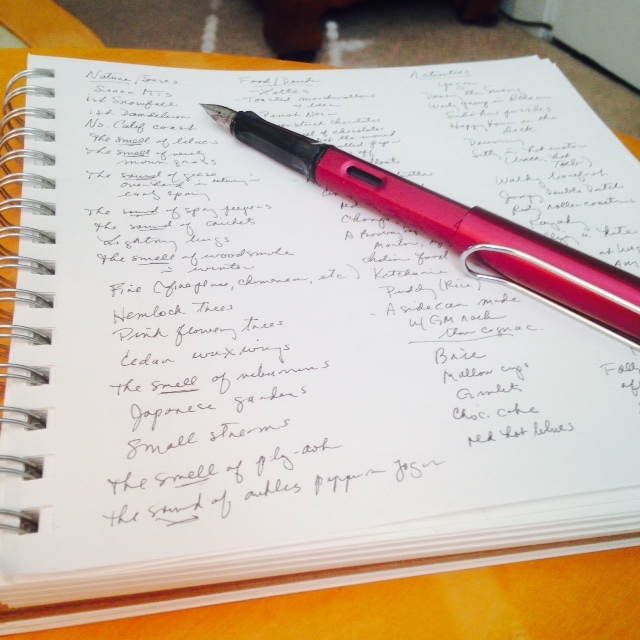 The work of building and tending those lists brought my life into incredible focus. Then I learned to meditate and take better care of my body. These two steps took the longest, but gradually I noticed that I had more energy and stamina, and I could stay calm when everybody around me was freaking out. This, I’ve discovered, is a very rare and in-demand skill set. Then I wrote down what I stood for, what I believed, and the qualities I wanted to spend my life trying to cultivate. This personal manifesto became my North Star. Now everything I put my time into has to align with that, or else I don’t do it. This makes decision-making super easy. Essentially what you are about to read in this book is a series of exercises that will take you through the process of list building and manifesto writing and project development, and all the rest. The exercises are fun and easy. They take time, and commitment to the process, but in the end you’ll end up with self-knowledge. With self-knowledge you won’t ever have to ever ask yourself again what you want to be when you grow up. Self-knowledge will render that question completely absurd and meaningless and stupid. Once you realize you’re constantly evolving and growing and changing and that there is no such thing as a “grown up” anyway, you’ll be free from that little box, that suffocating prison. I also want to help you negotiate the icky “What do you do?” question at parties. I’ve avoided many parties in my life for fear of that one question alone. Once you understand why people ask it in the first place, it’s a fun question to play with. I’ll teach you how to come up with funny and creative ways to respond that will move the conversation forward into rich and delightful territory. But most of all I want to help you discover exactly what activities jazz and excite you. Then I want to help you develop strategies to work those activities into what is probably your already over-committed life. I want you to find one absorbing, challenging and worthwhile project and see it through to the end. Then, after that project is finished, I want you to find another one. (Projects breed projects, so not to worry.) And another one. Until eventually your whole life—everything you do, and who you are, is defined by your current absorbing, challenging project. Eventually, your life will become just one cool project after another. You’ll love this project. It’ll be your baby. It’ll become your life at the moment. It’ll align with your values. It’ll make you excited to think about when you wake up. It’ll become who you are. We are what we love. It’s as simple as that. If we do the things we love, we show our real selves to the world. If we show our real selves to the world, that will give us the best shot at living a happy life. Start making a list of all the things you love. Include everything: people, places, states of mind, activities, food and drink, objects, times and seasons, nature and senses. Nothing is too trivial. If you love it, list it. The little spit sink at the dentist. Getting a letter in the mail. Looking down at the ground from a plane. The faces of kids in line to see Santa. List it all out. List out at least 100 things. Keep the list on your phone and add to it as you think of more and more things. Add to this list for your whole life. Try to get at least 50 things on this list. We are also the things we don’t like. Because when you know what you love, you know who you are. You have self-knowledge. This self-knowledge allows you to make conscious choices about who you hang out with, what you do for work, and how you recreate. If you know you love the outdoors and talking face-to-face with people (because you have these on your list) you’re less likely to take a cubicle job in a call center. You might not know what your ideal job is, but at least you won’t make that mistake. Your list can function as your “true north.” You can consult it whenever you feel bewildered, or have to to make thorny decisions. It is incredibly helpful to have a printed list of who you are, because even though we think we know these things, we forget. Then we get lost. And then we make really big mistakes from this lack of self-knowledge. Mistakes which might have been avoided if we had just consulted our list. It’s like forgetting to get the milk because you thought you’d remember. You should have put it on the list, dummy. We frequently forget that we are a complex composite of all the random and incongruent things we love. We forget that if we want to be happy, we can’t forget the milk. If our friends and our work and our fun activities are all aligned with the things we love, that is our best shot at being happy. That’s why we need to put it on the list. So we’ll remember.